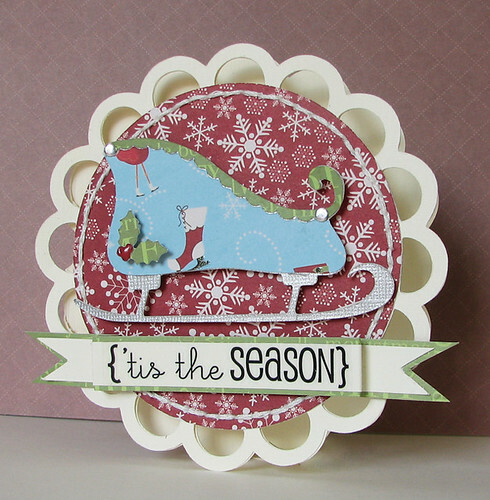 Scrapping Mommy: Christmas Card Set with SRM Stickers Plus A GIVEAWAY!! Christmas Card Set with SRM Stickers Plus A GIVEAWAY!! Are you ready for it?? Christmas?? I know, I know....it isn't even Halloween or Thanksgiving yet, but you can never start too early on Christmas cards. I can't believe that it is less than two months away......I am so glad that I have quite a few Christmas cards made already, because as it gets closer to the Chrimstmas holiday, I won't have as much time to make them. Here is a set that I made for the SRM Stickers blog today. I used my Cricut for all of the cuts as well as Imaginisce papers and the i-rock for each project.....can you spot the fun little i-rock embellishments on each card?? HOW TO ENTER: Just leave a comment under this post by next Friday letting me know if you have started on your Christmas cards/projects and I will draw a winner via random.org on Saturday, November 5th. ***Would you like an extra entry?? Be a follower or subscriber to Scrapping Mommy and leave a second comment (if you are already a follower, you can leave a comment letting me know that you are already a follower). Good Luck!! Love the cards!! I have not started on anything for Christmas this year. I think I've gotten lazy. I better get started, it is coming fast! I've been a follower for quite some time. Love your ideas! Wonderful cards - each one!!! LOVE the paper you used, and the little hidden bling on each one!!! I love your cards! I have started my Christmas cards, still have several more to make. TFS! beautiful cards. tfs. and no, i haven't started on christmas cards yet...i'm still working on halloween! just call me the great procrastinator. I've only briefly thought about Christmas cards. I should really get on them so they don't end up as New Years cards . . . again. I've started my cards in a minor way. I usually make 3-4 different ones just because I get bored making 40-50 identical cards. I've come up with one of them and have an idea I just need to test out for a 2nd. I follow your blog. I didn't say this in the 1st comment but great cards- I really like the trees one. Love your cards!!! I'm just starting to make my Christmas cards, but I know I'll end doing them in the last minute, LOL. 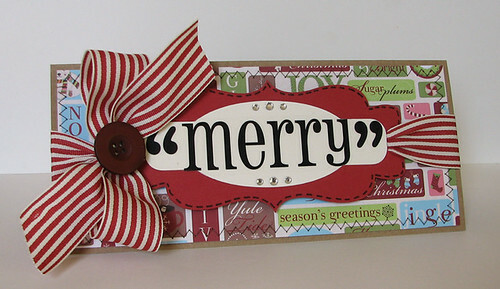 Love your cards, so fun and cheery, the colors are awesome for Christmas. I have not started my cards yet, whenever I see a Christmas card, (which is several times a day now, lol!) I get a little panicky! Thanks so much for the chance to win, this baby is on my wish list! These cards are beautiful!!! I have NOT started on any Christmas cards yet, but need to because it's only going to get busier and busier...lol!! Thanks for the inspiration to get started! Wow beautiful cards!! I have made some Christams cards and also decorations. I am a new follower! Thanks for the opportunity for blog candy! Amy I am already a follower because you do make such inspiring projects! oops, I fogot to say. My cards are done and I am going to start addressing them. I am mailing early this year. I am a follower through bloglines. I have started gathering ideas for cards. Guess I need to get busy, huh? Such beautiful cards! They are so bright and cheery, just love them. 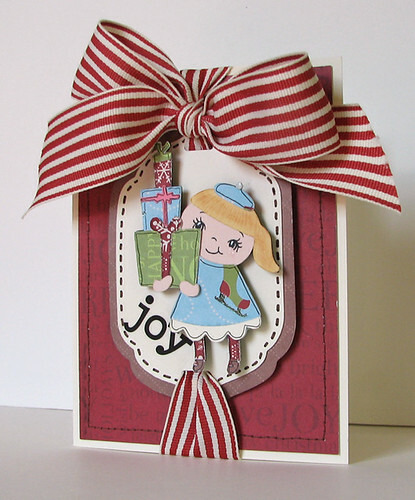 I have not even thought about anything Christmas yet, I'm envious that you have already created so many wonderful cards! I am a long time follower of yours and a fan on FB. Super fun projects! I'm a follower! TFS! I haven't started my own Christmas projects yet but am working on projects for a bazaar. Just came across your blog today-- I'm following you now. I've started on a few Christmas cards that I have posted on my blog. You have some REALLY cute cards! Love them! Good job! 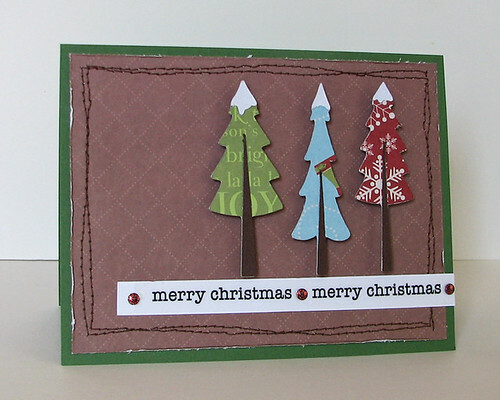 I love the tree card, so simple yet so nice. I would never have thought to cut the trees out of patterned papers like you did, very nice. No, I have not actually started my Christmas cards yet but I do think I have them designed, just need to get all the pieces cut so the family can start the assembly process, it is a fun family activity. Thanks for the chance to win an irock, would love to have one. I have a few made and coloring on others. Once I get that done it won't take long. I am a follower and a subscriber. I am also a subscriber to Scrapping Mommies! I love your Christmas cards, but jealous because I haven't started mine yet, But I have alot of ideas roaming around in my head... Thanks for a chance to win a new toy that I don't have! Hi Amy, I am currently a follower!! Love, love these cards! So festive! I seriously need to get started on mine! I've never made cards for Christmas before so this should be fun! Oh and already a follower and email subscriber! Beautiful cards! I have not started my Christmas cards yet. BUT I did start Christmas shopping last night! I am doing a craft show the next 2 weekends so I will start my cards after that! Thanks for sharing and the chance to win!! I am also a long a time follower and subscriber!! Thanks again for the chance to win! Love your Christmas cards. You put me to shame! Just call me 'Last minute.com', 'coz that's what I usually do, leave everything to the last minute then panic!